Everyone has seen the pictures of the unemployed waiting in soup lines during the Great Depression. When you try to tell a propaganda believing, willfully ignorant, mainstream media watching, math challenged consumer we are in the midst of a Greater Depression, they act as if you’ve lost your mind. They will immediately bluster about the 5.1% unemployment rate, record corporate profits, and stock market near all-time highs. The cognitive dissonance of these people is only exceeded by their inability to understand basic mathematical concepts. The reason you don’t see huge lines of people waiting in soup lines during this Greater Depression is because the government has figured out how to disguise suffering through modern technology. 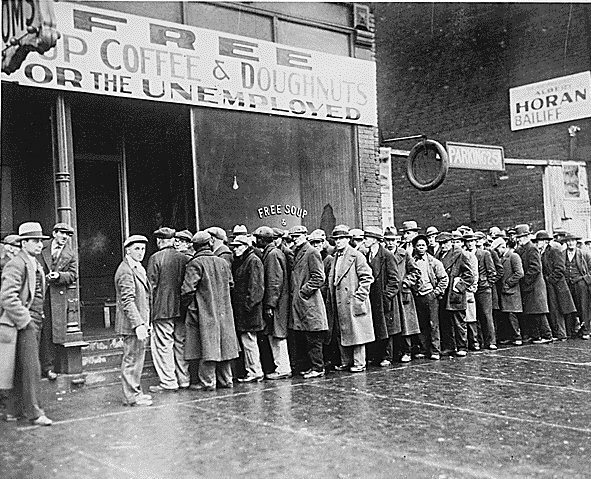 During the height of the Great Depression in 1933, there were 12.8 million Americans unemployed. These were the men pictured in the soup lines. Today, there are 46 million Americans in an electronic soup kitchen line, as their food is distributed through EBT cards (with that angel of mercy JP Morgan reaping billions in profits by processing the transactions). These 46 million people represent 14% of the U.S. population. There are 23 million households on food stamps in a nation of 123 million households. Therefore, 19% of all households in the U.S. are so poor, they require food assistance to survive. In 1933 there were approximately 126 million Americans living in 30 million households. The government didn’t keep official unemployment records until 1940, but the Department of Labor estimated 12.8 million people were unemployed during the worst year of the Great Depression or 24.9% of the labor force. By 1937 it had fallen to 14.3% or approximately 8 million people. The number of people unemployed during the 1930’s is an excellent representation of the number of households on government assistance during the Great Depression because 79% of all households were occupied by married couples with 4 people per household versus 48% married couple households today with 2.5 people per household. The unemployment rate averaged 19% during the heart of the Great Depression. Therefore, approximately 19% of all the households in the U.S. needed government assistance to feed themselves. That happens to be the exact percentage of households currently needing food stamps to feed themselves. We are now supposedly five years into an economic recovery. The unemployment rate, according to the government, has fallen from 10% to 5.1%. Maybe a comparison to the the Great Depression in 1937, five years after the worst of it, would reveal some truth. It is not easy to do an apples to apples comparison because very few women worked outside the home in 1937 and the average life expectancy in the 1930s was 60 years old. Today, the majority of women are theoretically in the work force and the average life expectancy is 78 years old. In 1937 only 5% of the population was over 65 years old versus 13% today.